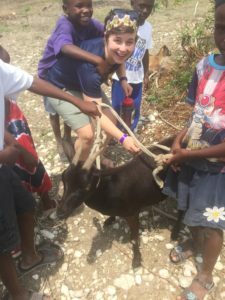 I (Sharon) had the opportunity to join a team from my church to spend a week in Arcahaie, Haiti. We just got back and it has been quite the adjustment! I am so thankful for the opportunity to be there and serve alongside the people there. We joined 2 other teams to work with an organization called Poverty Resolutions. 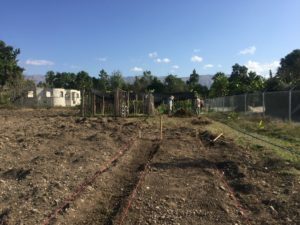 Poverty Resolutions has a compound in Arcahaie that helps equip the Haitians to learn valuable skills such as construction, agriculture, business, etc. 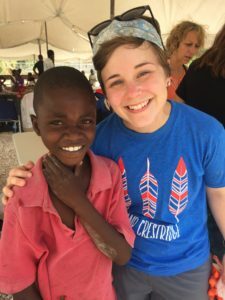 They also are developing relationships with the families in the community around them to help provide clothes, food and schooling for the kids whose parents cannot provide the funds for those things. 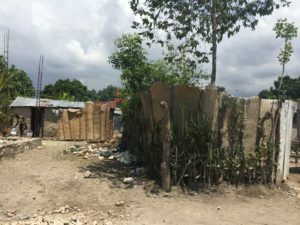 Many Haitians live off $1 a day. Think about that! Can you live off a $1 a day? I don’t know that I could. We got to see poverty in it’s truest form. It was a hard thing to see and grasp. 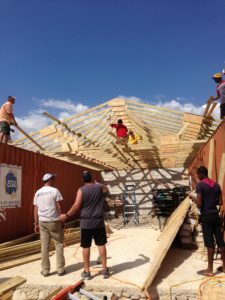 While there, our teams built 2 roofs, started a garden, hosted 4 medical clinics in 3 different communities, visited an orphanage, children’s hospital and provided encouragement to the Poverty Resolutions staff who live on the compound. 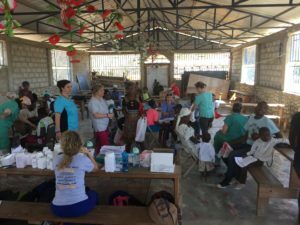 I mostly helped with the medical clinics but was able to help a little in the other areas as well. I loved playing with the kids in the community and watching them play soccer. The main language there is Creole. I have never spoken Creole before so the language barrier provided it’s own set of challenges. On the last full day, we spent a couple hours at Mother Teresa’s Children’s Hospital in Port au Prince. These children rarely had visitors. They were extremely malnourished and had illnesses that will be hard to recover from. Our goal while we were there was to hold as many of the babies and toddlers as possible. They don’t get the physical touch and attention they need so they were literally crying out for it. Several of us were in tears because we wanted to spend more time there to be able to give more attention to the kids. That was the hardest day, emotionally, to see those kids cry out for attention but also to see those sweet ladies who have given their life to take care of hundreds of kids. 1. Our younger generations are losing the ability to be creative. These kids have no toys, no electronics, nothing and they laughed, played with each other and love life! 2. I have so much stuff that I don’t need-clothing, books, electronics, kitchen utensils, living space, etc. It makes me appreciate what I have but I also question what I actually need to live. 3 (and the most important). JESUS IS ALL I NEED! If all I had was Jesus and His death and resurrection, I need to be ok with that. That’s all that matters! Silly arguments and disagreements, comparing myself to others, wanting more of something…all that doesn’t matter. What matters is that I accept the gift of Jesus that God has given me and live a life that serves God. Am I using the gifts and abilities He’s given me for His glory or my own? I pray that it will be for His glory! Another thing I learned is that it’s not realistic for me to come back and expect to sell everything I have and move back to Haiti. Or try to live off a $1 a day here in America. The U.S. is different than Haiti. But I do need to look for opportunities to serve those around me each day and live a life of humility. I am so thankful for the week I spent there and I hope and pray that I’ll be able to go back! Here are a few pictures from the trip! When we were in the church service, they sang a campfire song! Can you tell which one it is? !